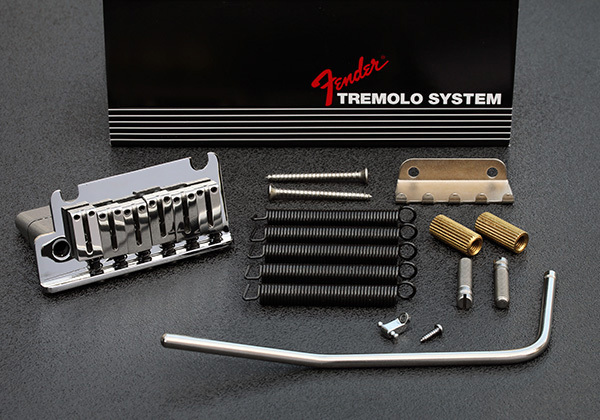 Genuine Fender® left handed two point pivot synchronized bridge assembly for American Deluxe/Ultra Strat's from 1986 to present date. Also installed in the new American Elite Strat. Can be used as an upgrade for American Standard Strat's as a drop-in replacement, no mods required. Modern narrow 2-1/16" string spacing. This is a LEFT HAND bridge assembly. Polished chrome block-style saddles with offset intonation screws. Two brass pivot pin bushings / inserts. Tremolo claw and mounting screws. String tree and mounting screw.